The Technics 1200 has long been revered by DJs for its high-torque, direct-drive platter that ensures flawless mixes and incredibly precise scratch performances. The last version of the turntable, the MK6, was released in Japan back in 2008. 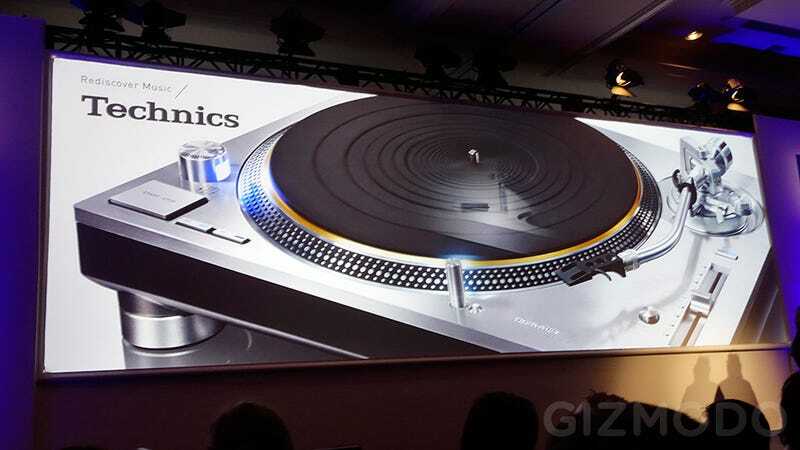 But today at CES, Panasonic announced it had revived the turntable with the new Grand Class Technics SL-1200G and limited edition Grand Class SL-1200GAE. It doesn’t look like Panasonic has messed with the form factor of the classic SL-1200 for the new ‘G’, but there are some key improvements inside. Direct-drive turntables like the Technics SL-1200 have sufficient torque to get its platter spinning at the appropriate speed almost instantly. But vibrations in the motor, which cause subtle speed fluctuations, do take away from the vinyl listening experience. With the new SL-1200G, Panasonic and Technics developed a direct-drive motor that’s lacking the iron core often blamed for those speed fluctuations in the platter. Any remaining vibrations from the turntable’s electric motor are further suppressed and corrected using new processor-controlled rotational positioning sensors inside the SL-1200G’s housing. The 50th anniversary limited edition Grand Class SL-1200GAE will be available this summer in a run of just 1,200 units. From what we can tell, the only advantages to opting for the premium version is a serial number plate on the base, a magnesium (not aluminum) housing, and early availability. Because if you’d rather settle for the presumably cheaper SL-1200G, it won’t be available until several months later in late 2016.